Valencia is located about 320 km southeast of the state capital Madrid at the mouth of the Turia into the Mediterranean Sea and is Spain's third largest city with almost 790,201 inhabitants. Valencia is an all-round talent and offers holidaymakers the opportunity to combine a relaxing beach and bathing holiday with an eventful city trip. Valencia has kilometres of sandy beaches along the Mediterranean Sea and an attractive natural environment, as well as many cultural attractions, an active nightlife and a varied city centre. The city can be reached by plane via the Aeropuerto di Valencia (VLC), Valencia's airport. The airport is only 10 kilometres from the centre of Valencia. After landing, it is particularly convenient to hire a car directly from Valencia airport. Valencia and its surroundings offer many highlights that travellers want to discover. With a rental car, all attractions in and around Valencia are flexible, comfortable and cheap to reach. If you are looking for a cheap rental car in Valencia, check out our price comparison. Simply enter your desired travel data, insurance and additional services in the search mask and let us convince you of the favourable offers of our partner car rental companies. We always strive for a price-transparent and clear representation of all car rental offers for Valencia. Benefit from our safety guarantee, a wide selection of different vehicle categories and safe and convenient handling for an unforgettable and carefree stay in Valencia. The practical station filter helps you to select the best offer for your desired pick-up station in Valencia. There are numerous car rental stations in the city of Valencia and the surrounding area. Travelers have the choice and can choose to rent a car in the immediate vicinity of Valencia airport or their own accommodation. Renting a car at the airport is conveniently located and offers the advantage that you can continue your journey as soon as you arrive at the airport. This allows you to enjoy the benefits of independent travel by rental car. If you choose a pick up point in the city of Valencia - no problem - there are also many offers from the local car rental companies. A price comparison is always worthwhile in order to find the best offer with the best price-performance ratio. Depending on individual ideas and needs, travellers can choose from a wide range of vehicle categories. So it is entirely up to you whether you prefer an agile small car, a larger family car or an open convertible, for example. Rent an all-terrain vehicle for the off-road adventure in Spain? This is also possible at the local car rental. Usually a rental car is already fully equipped at the time of booking. Nevertheless, travellers in Spain should note that they must always carry a warning triangle, safety vest and first aid kit when driving a vehicle. All necessary insurances for the rental car can be selected directly with the online booking. Liability insurance is one of the most important insurances. But also the comprehensive insurance as well as the theft insurance should not be missing when renting the vehicle, so that the traveller does not have to pay for damages to the car. Find out whether your car insurance for Germany also applies in Valencia, Spain. This may even save you additional costs for car rental insurance in Valencia. Most of the roads in and around Valencia are very well developed. Many traffic routes lead through the nature of the region or were built directly parallel to the coast. Unless otherwise specified, the maximum speed in urban areas is 50 km/h and on country roads 90 km/h. On motorways there is usually a maximum speed of 120 km/h to consider. Drivers under 25 years of age might be subject to different speed limits in Spain. For further information you should consult with the lessor on site. Some motorways are subject to tolls. Numerous parking spaces are available at many of the major attractions. Parking spaces with a white border indicate that parking is generally free of charge. Parking in blue marked parking areas is only possible for a fee and parking on yellow lines is prohibited. Valencia is the third largest city in Spain and is considered to be a very lively and multi-faceted metropolis in which there is much to discover. A rental car is therefore ideal for exploring all the attractions, large and small. The Cathedral of Santa Maria de Valencia is certainly one of Valencia's most popular sights. An imposing building, which can be found in the centre of the city. This bishop's church was built from 1292 and is not only an impressive building from the outside. Inside there is the sacred chalice from the first century B.C., a true treasure. If you explore the old town by rental car, you will not be able to avoid another attraction, namely the Lonja de la Seda. It is a Gothic silk fair that has been on the UNESCO World Heritage List since 1996. Once it was the central trading place for silk. Today, the Silk Exchange is one of the most important late Gothic buildings in Europe. Valencia's Ozeaneum can also be reached in a short time by rental car - by car in around 30 minutes. This is Europe's largest aquarium, in which more than 45,000 sea creatures can currently be discovered on an area of around 110,000 square metres. Valencia has an impressive and diverse flora and fauna. The natural monument Nacimento del Rio Cuervo is certainly one of them. This is a source area of the Cuervo River. Many torrents, a rugged rocky landscape and a rich fauna inspire not only passionate hikers and biologists. Another attraction of this kind is El Salto de la Novia, a waterfall and lake area. The largest waterfall has a drop height of about 60 meters and is known for its clear water. Particularly popular in Spain are certainly the many sandy beaches at the Mediterranean Sea. In Valencia, they are close to the city centre and can be reached in around 15 minutes. The city stroll or the visit of the various gastronomic highlights can be combined well with an excursion to the beach. The beaches offer the ideal conditions for sunbathing, but also for sports activities such as beach volleyball, diving or sailing there are many offers. The beaches El Cabañal, Las Arenas and Malvarrosa are among the most popular beaches with a blue flag. Those who prefer the natural beaches with dense vegetation should visit the beaches of the Albufera Natural Park or the beach of El Saler. Valencia is considered the centre of the Costa de Valencia. This makes this big city an ideal starting point for trips through the surrounding countryside. 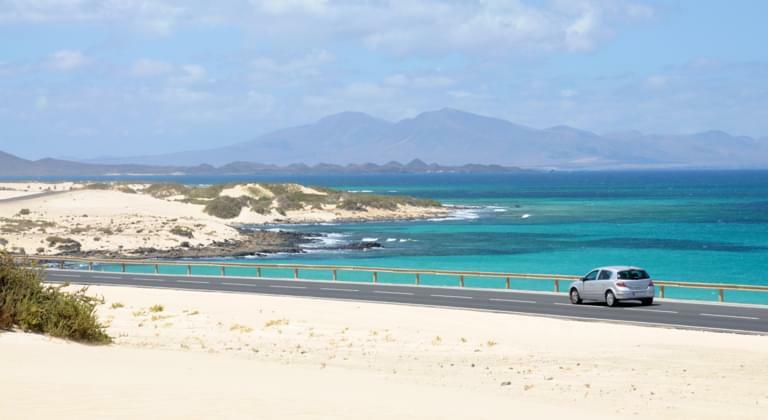 With a rental car you can not only reach many tourist highlights within a short time, but also some of the famous cities and islands like Ibiza or Mallorca. The distance to Ibiza is about 168 kilometres and to Palma de Mallorca about 260 kilometres. There are direct ferry connections from Valencia to Ibiza and Mallorca. For the crossing, there are offers for passengers with and without a car. This means that even after the crossing to Ibiza or Mallorca you do not have to be without a rental car. If you want to rent a rental car and explore the cities of the surrounding area on your own, you will be in well-known cities like Barcelona or Madrid within a short time. Barcelona, some 350 kilometres away, can usually be reached in less than four hours by motorway. Barcelona is not only Spain's second largest city, it is also considered one of the world's most important cultural metropolises. Among the tourist highlights of this city are certainly the La Sagrada Família of the Spanish architect Gaudi, the archaeological sites from Roman times or the imposing cathedral of the old town. Only Madrid is bigger in Spain. This city is also about 350 kilometres from Valencia and is conveniently located in terms of transport. Most of the four-hour drive can be done on well-developed highways, so it is worth renting a car to explore the city. Due to its convenient location, many tourists in this region choose a round trip through Spain. In this case it is of course possible to determine an individual pick-up and drop-off station. And if you are not able to book your rental car - no problem - thanks to the free cancellation you have the possibility to cancel your booked rental car free of charge up to 24 hours before the start of the rental!